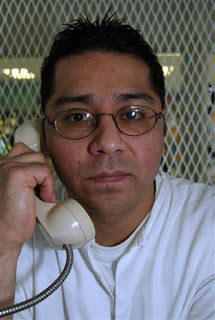 Rogelio Cannady was executed today in Texas. He was the 457th person executed in Texas since 1982 and the 218th person since Rick Perry became governor. He was the 10th person executed in Texas in 2010. If you live in Texas, call your state legislators and let them know that you support a moratorium on executions. Find out who your legislators are here. (AP) HUNTSVILLE, Texas (AP) – Condemned Texas inmate Rogelio Cannady was executed Wednesday evening for killing his cellmate while already serving two life sentences for a double murder. Eight minutes later, at 6:19 p.m. CDT, he was pronounced dead. He was the 10th inmate put to death in the nation’s most active death penalty state. It was the second appeal rejected by the high court this week in his case. State attorneys said the late appeals were without merit and that questions about Cannady’s confession already had been resolved. Cannady was sentenced to two life sentences after pleading guilty to the 1990 murders of 16-year-old Ricardo Garcia of Freer and 13-year-old Ana Robles of Brownsville – both runaways from a youth home. Garcia was stabbed 13 times. Robles was raped and strangled. Two of Garcia’s brothers also witnessed Cannady’s death. Cannady did not address them and the brothers declined to speak with reporters afterward. Cannady, who was 17 at the time and one of four teenagers arrested in the case, said an investigator persuaded him to sign a confession to avoid the death sentence. John Alba, 54, faces lethal injection in Texas on Tuesday for gunning down his 28-year-old estranged wife Wendy in Allen in Collin County in 1991. I firmly believe in the death penalty. The very notion that the victims family should have to, through taxes, pay to feed, clothe, and medically care for the very person who murded thier loved one makes me sick. I have been in prison and I know that if I were to commit the crime of taking someone elses life I would ask for the death penalty. Why should the victims family continue to pay to keep me alive and healthy. I would also submit that this life is only temporary and suggest that a murderer get right with God before the day of execution since that will be his final judge.